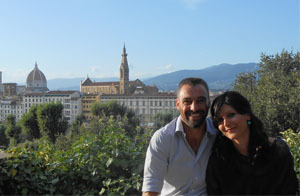 Are you looking for a professional tour guide to visit the beautiful attractions of Florence? Rely on Florguide, contacting Michela and Lorenzo. Inspired by a passion for the history and art of our city, we have become licensed guides of Florence. Our tours, which are exclusively private, will give you the opportunity to get to know the museums, the most impressive churches or discover the major attractions, by walking through the historic city center. If you have any special requests, please contact us without commitment and together we will set up your perfect custom tour. The guests of our facilities Hotel Rapallo and San Giuliano Inn Florence will be entitled to a special 10% discount on all our rates.